League of Legends 2018 World Championship is coming, so likewise the Worlds Pick'em Event. This event will test your guessing skills on what teams will win on Worlds 2018 - Group Stage and Knockout Stage. If your predicted picks succeed, you'll receive awesome rewards exclusive to this year's event. Group Stage: Brackets will be available on October 8 at 10:00 AM PH time, and be locked before the start of Group Stage games on October 10 at 04:00 PM PH time. Knockout Stage: Brackets will be available on October 18 at 12:00 AM PH time before the start of Knockout Stage games on October 20 at 12:00 PM PH time. Two new Poro icons are obtainable. You'll get the 2018 participation icon when you complete any Pick'em bracket. If you score at least 34 points during Pick'em, you'll also receive the Worlds Wizard Pick'em Poro summoner icon. If you get every single pick correct, you'll be rewarded with a set of five Ultimate skins: Elementalist Lux, Pulsefire Ezreal, Spirit Guard Udyr, DJ Sona, and Gun Goddess Miss Fortune. Visit pickem.lol.garena.ph on October 8 to get in on the Group Stage action, and remember to return for Knockout Stage picks on October 18! To play, log in your account in pickem.lol.garena.ph and make your picks before the two stages of matches during Worlds. The more accurate your picks, the more points you'll gain. Garena LOL PH will be granting icons to players starting in mid-October. If you are eligible for these icons, you should get them no later than three (3) days after the event ends on November 3. If you have not received these icons after three (3) days, please contact customer support (https://www.garena.ph/support/). If you accomplish perfect pick, congratulations! A perfect pick means that you were correct in every single pick for both Group Stage and Knockout stage, and won the maximum amount of 124 points. The reward for a perfect pick is all 5 Ultimate Skins. 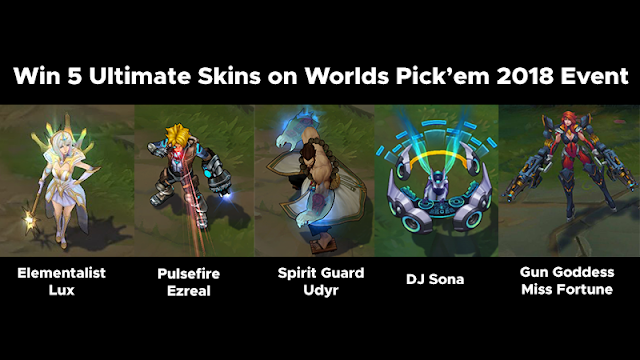 Including DJ Sona, Spirit Guard Udyr, Pulsefire Ezreal, Elementalist Lux and Gun Goddess Miss Fortune. To be eligible for this reward, your account must be at least level 20. You can compare your score to all other summoners playing by going to the Pick'em Leaderboards (https://pickem.lol.garena.ph/leaderboard). Where to watch Worlds 2018 live? 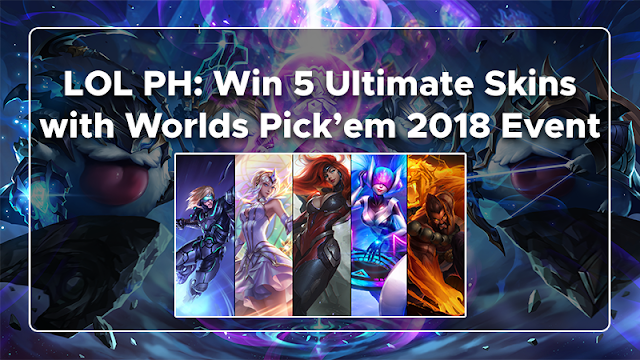 What can you say about the rewards for Worlds Pick'em 2018 event? Let us know in the comment section below.